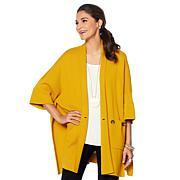 From cool days to warming trends, this cardigan gives you simplicity and elegance … and coverage. I purchased a number of layer items in this chiffon fabric- blouse, palazzo pant, tunic... and felt this would be a good addition! 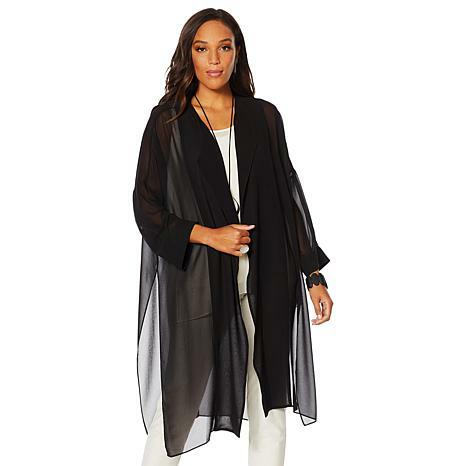 I dont like doing sleeveless much- but what a great kimono style duster. I think it could be a bit overwhelming.. and certainly dramatic, but I love it as an addition to my wardrobe. I also feel it could double as a bathing suit cover!!! Thank you Marla for adding spice to my black wardrobe! !